Linda Preece's photography of Clarke Quay represents the famous landmark located on the banks of the Singapore River. Clarke Quay is both rich in history and a thriving modern hotspot. Clark Quay is where Singapore likes to party and is always the first stop on our sightseeing checklist for visiting guests. The infamous Singapore River cruise is a perfect way to learn about local history and architecture without the hustle and bustle of an otherwise, busy city. Located on the banks of the Singapore River, Clarke Quay is both rich in history and a thriving modern hotspot. During the 19th century, boats would arrive from downriver bearing goods to be stored in the warehouses at Clarke Quay. Today those warehouses have been restored and house a slew of lively restaurants and bars, making this one of Singapore’s busiest entertainment districts. 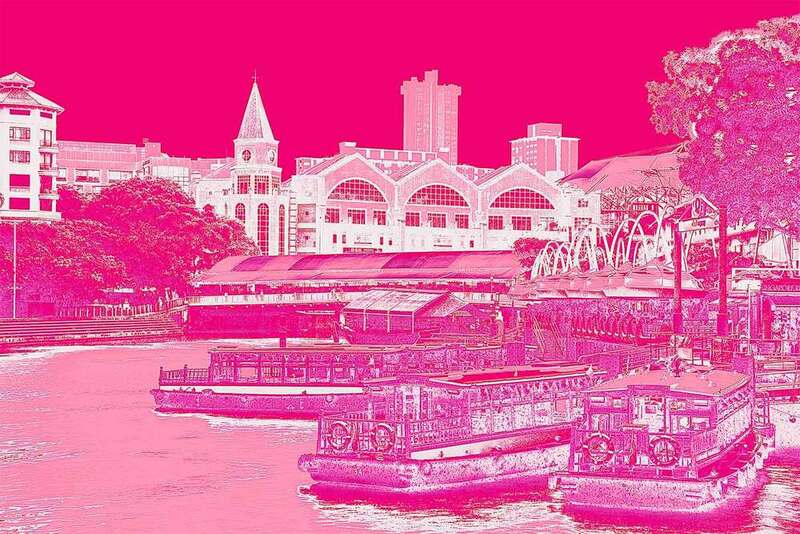 The Vibrant Clarke Quay collection captures a group of Singapore River’s ubiquitous bumboats jostling for space at the pier against a background of Clarke Quay’s distinctive restored warehouses. These richly hued images will evoke memories of warm evenings enjoying drinks with friends, strolling along the river and taking leisurely boat rides.